This fine-feathered Green Heron, Butorides virescens, was creeping in the bog, no doubt angling for some fish for lunch. He flew off after spotting me (I attempted unobtrusiveness, but obviously failed!). The heron returned to the pond shortly afterward–the allure of a fish meal greater than wariness of the gardener. Smacking his beak in pleasure, the pond is now short a few gambusia (mosquito fish). 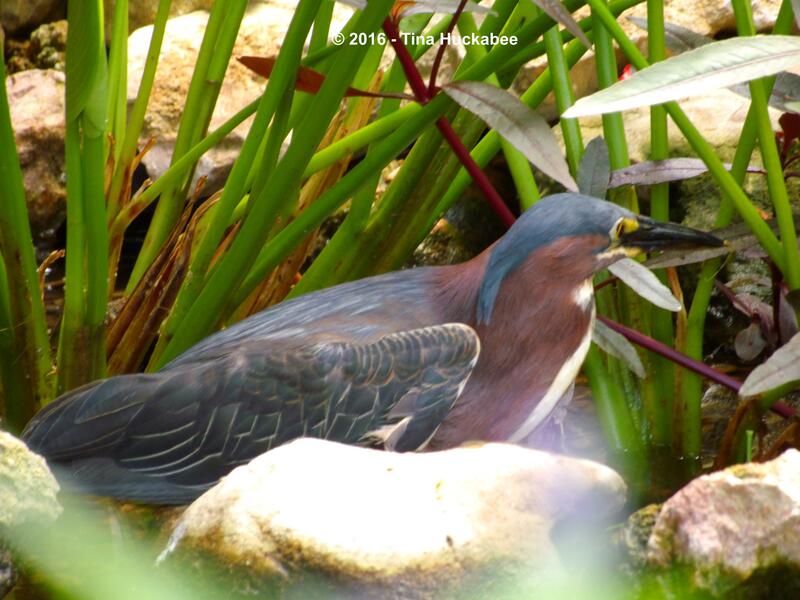 This entry was posted in Green Heron, Uncategorized, Wildlife Gardening by Tina. Bookmark the permalink. You have some great visitors to your garden! How fun to have a heron visit your pond! He’s a beauty! He’s a pretty boy, I agree! Oh dear Tina, but I guess you get to see even more exciting wildlife visit! I was thrilled with this one! I’ve seen them before, but they always fly off just as I blunder out of the house. This one stayed long enough for him to eat and me to look. 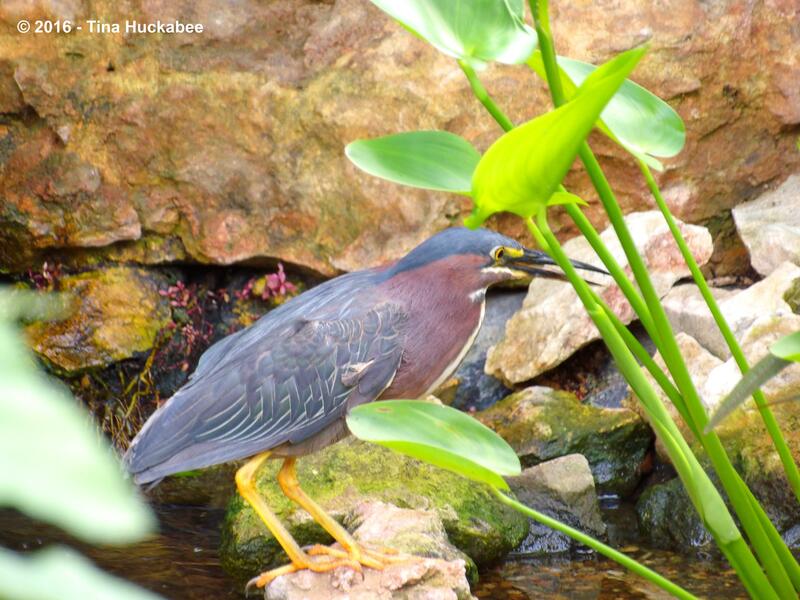 We have herons…Green and Blue…visit the creek, behind the house. I think they’re eating frogs and tadpoles. The Greens make a funny noise. They’re pretty, though. Nice! I’ve had Blues visit too, but have never been able to get a good shot at them. I bet they like those frogs and toads and tadpoles and oh, so many things! Interesting about the noise–gonna go check that out on the Cornell site! Or, maybe she is?? Actually, I have no idea of the gender, but I don’t really care. Fun, fun in the pond! You always have such great birds visiting your garden and you get great shots of them too, I don’ t know how you do it. Pond. Pond. Pond. Migration highway. Yeah, I don’t think the fish are cheering the exploits of the heron. Impressive looking bird. I thought it was a garden ornament at first! He’s good-looking enough to be garden eye candy! Tina que maravilla la Garza comiendo y sabiendo que está usted allí. Y la Garza la mira Tina¡¡¡¡¡¡ Que formidable momento. What a lovely creature! I’m guessing the fish reproduce in ways that keep their numbers ahead of any losses from the Garden’s very own Big Birds. I can feel everyone reading here regularly slowly but surely realizing they need a pond, a pond, a pond! Yes, there are multitudes of mosquito fish. I am down one goldfish though since cleaning the pond in early March. Not sure who snatched that one…. I just love green herons. To see one in the backyard must have been a heart stopper. Gorgeous bird. I felt very fortunate that that beautiful bird visited.